I don’t even think I need an intro for this one. I think the title really speaks for itself. This is – Buttermilk. Aspic. Ring. Soften gelatin in cold water for 5 minutes. 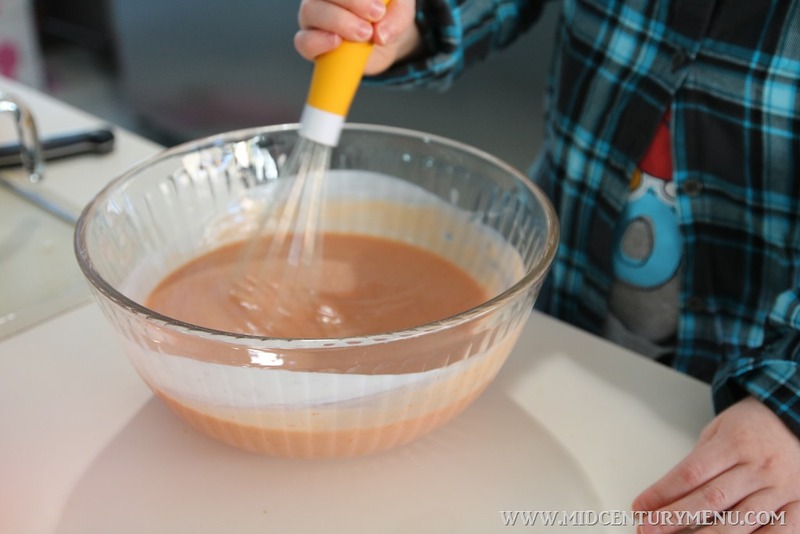 Add boiling water and stir until gelatin is dissolved; cool to room temperature. 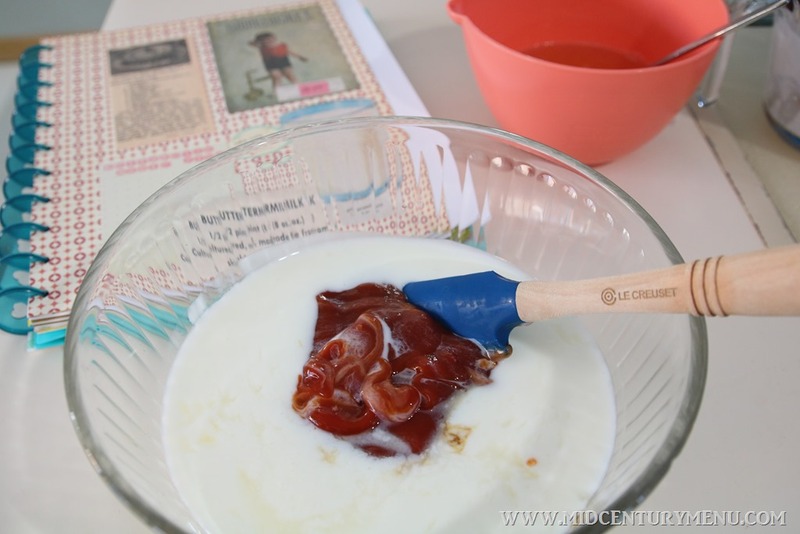 Combine buttermilk, salt, lemon juice, sugar, Worcestershire sauce, catsup and onion. Add gelatin and whisk well. 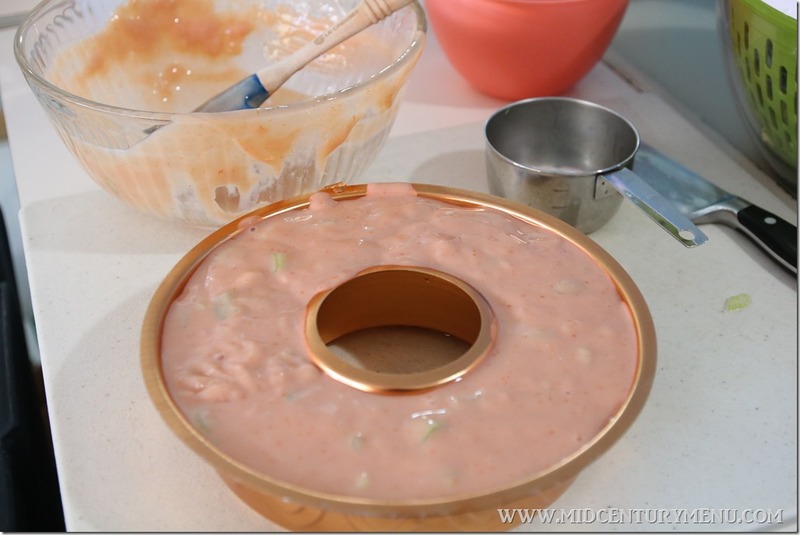 Chill until consistency of an unbeaten egg white; fold in celery.Pour into a 1.5 quart ring mold (about 3½ cups) and chill until firm. Unmold on plate; line center with lettuce and fill with chive cottage cheese or any desired fish, meat or chicken salad. This week’s recipe comes from Workbasket Magazine. If you didn’t know this already, vintage Workbaskets have a fantastic themed recipe section in each issue. Sometimes they will even have two of them, including a reader submitted recipes that can be made and sold for profit, like cakes, pies and jams. 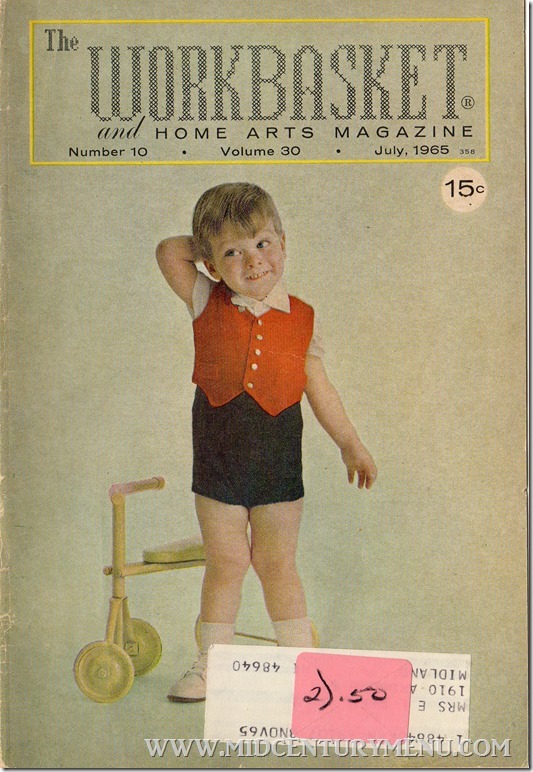 In any case, the main recipe section in this magazine was themed around luncheon dishes. 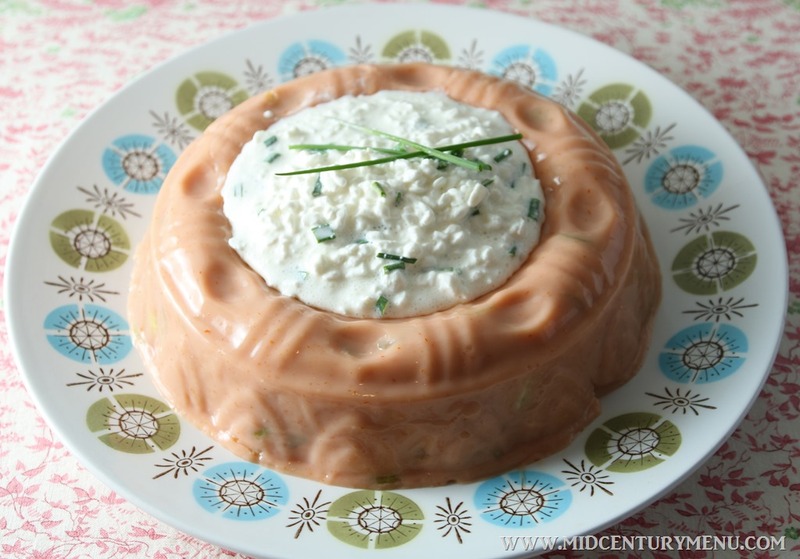 Next to this buttermilk aspic recipe was a rather spectacular creamed chicken aspic. 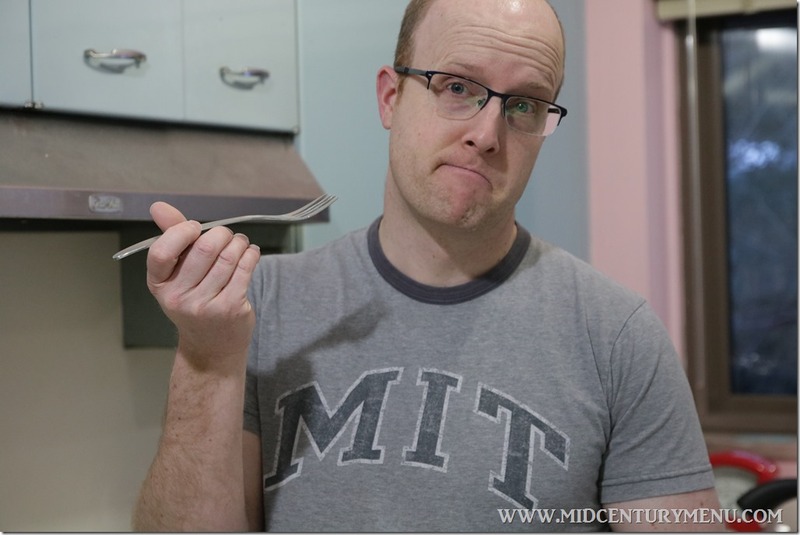 If your wondering about the book behind the bowl, that’s my mad-science lab notebook for 2017, also known as Mid-Century Menu’s Kitchen Scrapbook. I normally have a book where I jot down all my notes and impressions and keep all my scraps and things together, but this year I decided to make it a bit more fancy. If you want to see more of it, I’m going to be showing sneak peeks of upcoming recipes on Instagram! This was before adding the gelatin. It was already pretty thick! Alex insisted that she help stir in the “Jell-O part”. I really wish Tom would have been home when I was making this, so I could have gotten a video of pouring this into the mold. It was gloriously disgusting. Slurping sounds and everything. And the smell was horrific. Cross section. So you can appreciate the added celery. And my plate! I got this lovely for Christmas this year. Thanks, Mom and Dad! To my utter shock, this was not terrible. In fact, it might even be upgraded to “not bad” status. I thought for sure that the stupid ketchup would ruin everything like it always does, but it actually only ended up tasting mildly sweet when combined with the lemon juice and buttermilk. It tasted like a tangy/sweet aspic with a crunch from the celery. The Worcestershire sauce gave it a hamburger aftertaste, which was a little freaky, but not too horrible. Even the chive cottage cheese complimented the flavor. Now, if I were going to make this again, I would probably sub tomato juice for the ketchup, since that seemed a bit too…ketchup-y…for my tastes. A mild tomato flavor would have been better. But overall it was edible bordering on not bad. In my teenage crash dieting years I used to take cottage cheese and put ketchup on it (or a fat free dressing, it was the early 90s after all). It was…..surprisingly not bad at all, and this just gives me major flashbacks to that, just obviously much more fancy. 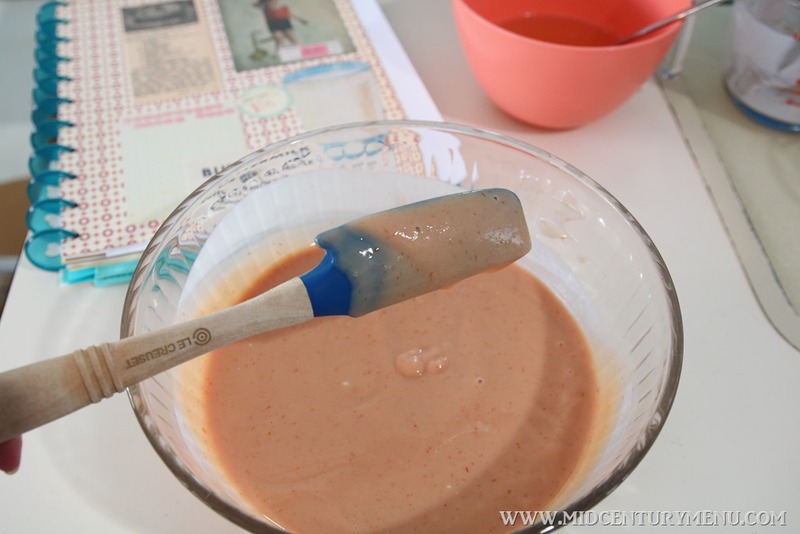 I feel like this might be a little like 1000 island dressing flavored jello. It’s the buttermilk and ketchup combo. Would this be served with crackers? or were you supposed to take a bite of the cottage cheese and then a bite of the aspic? I want to try this, but due to my dairy allergy, I will have to make some substitutions, and I will probably put chicken salad in the middle. You are very brave. My mother used to make a tomato aspic for Thanksgiving every year. It had shrimp and celery in it, and it was horrible. It may be why I still hate celery. I love your plate and jello mold! I went to culinary school and spent and entire semester on “cold foods” a.k.a. Garde Manger. If I never seen Aspic again, it will be too soon. 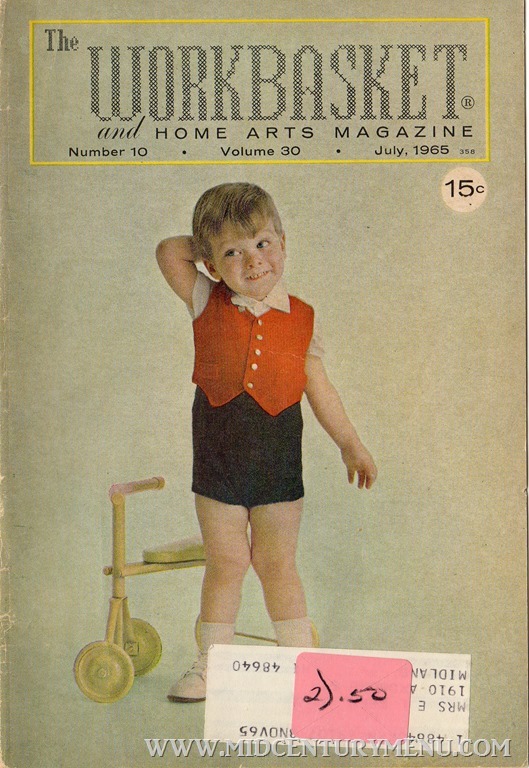 I tend to follow/comment on Mid-Century Sara’s posts but I just couldn’t help but comment on this. 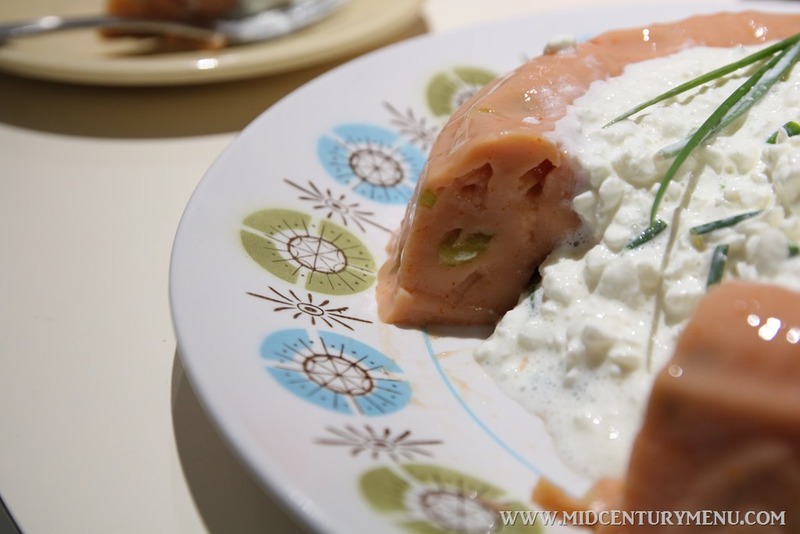 Back in the 80s I made an aspic made with chicken bouillon, shredded chicken, carrots, sliced cucumber and cottage cheese. My husband was absolutely horrified when he saw it. But y’all are very brave to try this. I love everything on MCM! Your blog and the subsequent comments are very, very entertaining! I think I would be tempted to add horseradish to this, if I were likely to make it. This is basically a gelatin version of the “French dressing” my dad used to make. I’ll pass, thanks.